Everyone knows the very famous Atom™ based NAS N4800. 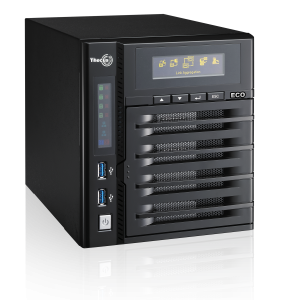 Following the success brought by the N4800, Thecus® is now announcing the new N4800Eco. The N4800Eco features some of the best characteristics from the N4800 like the Intel® Atom™ processor, USB 3.0 ports, eSATA port, HDMI output and dual display. This very powerful NAS will become a must-have for all small and medium businesses in need of centralized storage, application serving, and top-notch response time within multi-user environments. For the more demanding users, the N4800Eco will also have its use at home. As it is already been proved with the N5550 and N4800, the Intel® Atom™ CPU performs like a real Olympian athlete! The Atom™ CPU is more energy efficient and is designed to work without a fan, greatly reducing its energy consumption and associated cost for the benefits of the user. This also dramatically reduces the NAS noise, making it more comfortable to have around your desk or living room. Associated with large amounts of DDR3, the Atom™ will provide much better performance. Reaching the limits of Gigabit bandwidth on a “small NAS” is already a standard in the industry. But what if you (and you will) want your NAS to give you more? Multi-user environment, web hosting, intense backup, data encryption, application serving, heavy RAID computations, and HD multimedia streaming: welcome to the world of smooth multi-tasking! The N4800Eco is equipped with the latest ThecusOS™ 5.0 preinstalled. The new ThecusOS™ 5.0 is the key piece that will unlock the most efficient and advanced NAS on the market. This means that users will be able to access more innovative functions with their Thecus® NAS. Two of these functions are Data Burn and Data Guard. With Data Burn, the users have the possibility to back-up their critical data by burning them onto a CD, DVD or Blu-ray disk. By plugging a disk burner to their NAS thru the available USB ports and managing the burning process. But your back-up options don’t stop there. Also included in the new ThecusOS™ 5.0 is the total backup solution, Data Guard. This backup solution is the ultimate software as it provides both local and remote backup. Data Guard uses innovative technology to sync data across the network to other NAS and servers. More importantly, Thecus® Data Guard is the total backup solution which makes managing NAS user-friendly and convenient. Additionally, Thecus® users will also be able to take advantage of the cloud for their back-up solution. With support of the Amazon S3 cloud back-up services, the users will have one more option to keep their data safe and away from harm! Handling multimedia and accessing your NAS has become a much more direct and simple process! With the HDMI output located in the back of the N4800Eco, you can directly connect to an HD TV screen and start monitoring your NAS without the use of a computer. Using the local display module, a keyboard and a mouse plugged through the many USB ports, the user has the power to simply access the NAS UI, play HD video, display pictures or listen to their music, all of this with the display comfort of a big TV screen. Ideal for small installations and/or mobile users, these features are designed to lower the total cost of ownership of your network architecture. Thanks to the new Thecus® mobile phone application T-OnTheGo™, your N4800Eco’s content will be available where ever you go. T-OnTheGoTM is a utility to manage files and folders on Thecus NAS, playback audio and video media, and view photos and documents. With this app, Thecus NAS users can also sync files from the NAS to their iPhone and iPad for local playback later. Local file management within the app is also provided for downloaded files.